Today, let me share with you the DOs and DON'T for acne-prone skin. 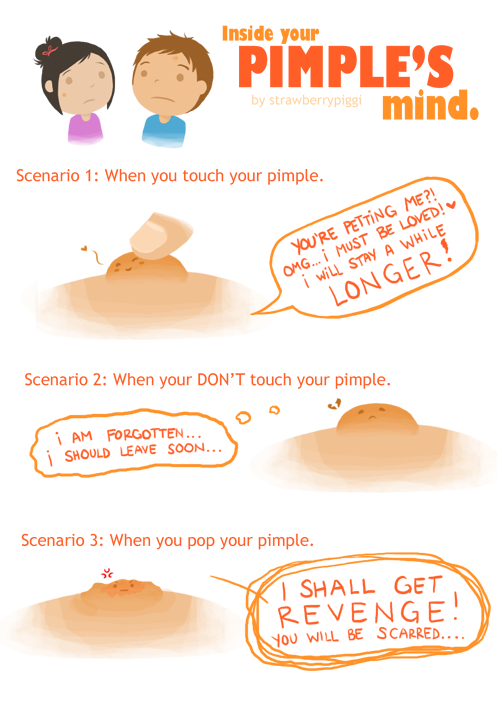 By understanding your acne, you can determine the most suitable treatments to deal with them. I have shared two videos at the start of this post. In the videos, they explain to you how acne is formed and the different types of acne. Scroll back to the top if you have yet to watch the videos. For those who have watched them, let's skip to the next point, shall we? This is very important to all, especially for people who have sensitive skin... For example, people with sensitive skin have to be really cautious in choosing products. Well, you readers should know that many acne products contain anti-acne ingredients at different strength level/concentration. Some may be too strong for sensitive skin as a result, it may cause some signs of irritations. Hence, it is absolutely necessary to know what skin type you have, in order to determine the most suitable products/treatments for your skin. Keep Your Hands Away From Your Face! Your hands have lots of invisible germs and bacteria thus, keep your hands away from your face! It's better to thoroughly wash your hands with hand soap (anti-bacterial soap will be preferred) prior touching your face. You wouldn't want your face to become a new breeding ground 'playground' for the germs and bacteria right? So don't touch your face with your unclean hands! FYI, I always wash my hands with Dettol Hand Soap before proceeding to cleanse(touch) my face. Same procedure applies during application of daily skincare products, makeup etc..
Look for products labelled "Non-Comedogenic" and "Oil-Free". Non-Comedogenic means "less clogging pores" whilst for Oil-Free means the product does not contain any mineral, plant oils etc. so it's less likely to clog pores. If you are having troubled with acne, look for products that contain anti-acne ingredients such as Salicylic Acid, Benzoyl Peroxide or Tea Tree Oil. These ingredients are strong enough to combat acne and keep them under control. Skin care routine doesn't have to be complicated. A 3 to 4 steps routine (Cleanse, Tone [Optional], Moisturize, Treatment) is all that you need, especially for teens. Also, it's a not a good idea to change skin care products too often. Changing your skin care products frequently may cause more breakouts at times. My advice: Choose a set of products and as long as they are working fine on your skin, STICK TO IT. Modify your skincare routine only when it's necessary. e.g. : seasonal changes, targeting other skin problems, product seems to make your skin condition worse etc..
'Multi-tasking' can cause more problems at times thus, take it slooooow~~~ Work on one problem at a time and you will get optimal results. Eat Healthy; Stay away from spicy, greasy, fried and junk foods. I believe that the diet plays a part in contributing acne. I have mentioned the following in the 7 Must-Dos... post, which I have shared earlier on. "Kick away all (or eat less) the spicy, greasy, fried and junk foods! Consume more fruits and veggies (at least 2 servings each every day) instead as they contain powerful anti-oxidents which help to prevent free radical damage, protect your skin cells and slow down the aging process. Not only that... They are also rich in various nutrients(vitamins, minerals, fibers) which help to boost your immune system, detoxification, and improve your complexion, keeping your body and skin healthy." Tempting? But I strongly suggest you to leave the little monsters alone! Bear in mind that popping the zit only pushes infection further into your skin, causing more swelling, redness and scarring. Here's an interesting illustration I found on Twitter that I once shared. 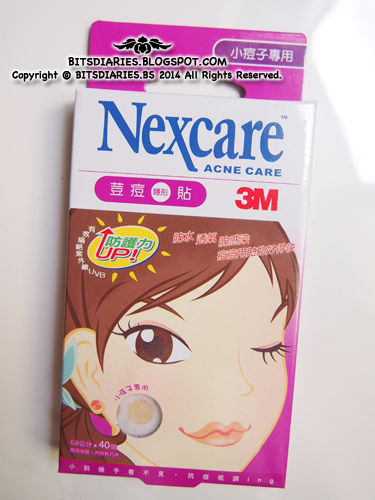 Instead of squeezing and popping the zit, try using Nexcare Acne Patch. This little patches work effectively in sucking out all the pus embedded in the zit without needing to forcefully squeezing the zit hence, it helps to reduce and prevent bad scarring and/or further inflammation. This comes in very handy when the zit popped itself or you accidentally scratched and popped the zit. Wash your face TWICE a day will do the job! Cleansing your face several times a day does not cure your acne. In fact, you are making acne worse instead. When you over-cleanse your skin, you are stripping away all the skin oil/moisture that acts as a function to keep skin healthy, moisturized and balanced. Deep down, your skin naturally pumps out oil to the surface to keep it moisturized so if your skin is too dry, it will produce even more oil to compensate for the dryness. This could lead to excess oil production and eventually lead to clogged pores. So now you know each time you cleanse your face, you are actually stripping away some skin oil/moisture. Hence, we need moisturizer to replenish the loss. Remember that a well-hydrated skin helps to slow down the rate of oil production. I strongly advise to stick to ONE anti-acne ingredient. For example, if you are using a product (e.g: a toner, serum) that contains Salicylic Acid, then for other products (e.g: moisturizer), make sure they contain the same anti-acne ingredient (Salicylic Acid). Using too many types of anti-acne ingredients at a time can cause skin irritations! I know some people use Salicylic Acid and Tea Tree products together and it work for them but well... not everyone's skin can handle more than one anti-acne ingredient at a time, at least not for me. If you want to try out, do a patch test before applying it on your face in case of any irritations. Your acne needs to breath! Layering heavy make-up on pimples cause a perfect breeding ground for the germs and bacteria to grow and this will cause pimples to get more inflamed. Apart from that, heavy make-up leads to clog pores even more easily so try to wear light makeup as possible. If you really want to wear heavy makeup, do it once in awhile. Just don't wear heavy makeup every day. Well, in any case, make sure you remove all traces of makeup thoroughly before you go to bed! Alright, that's all I could think of for now. If there's any more tips, I will share it in another post. Hopefully the tips I've shared would be able to provide some help for you. When choosing for the best acne soap to use for your pimple and acne difficulties, you need to consider a number of factors. The acne soap for you depends on your needs, type of your skin, and severity of the skin condition.